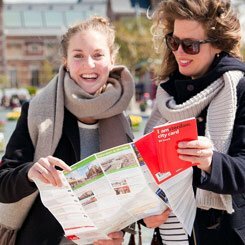 Whether you are planning a lengthy visit or a simply a weekend break to Amsterdam, this Amsterdam city guide helps you get started with concise, relevant Amsterdam tourist information. As any Amsterdam city guide would concede, Amsterdam is really an all-year round destination thanks to its diverse and often indoor attractions. Hotspots such as the famous Rijksmuseum and Van Gogh Museum, the architecture in the old city center, the coffee shops and the red light district can be visited every moment of the year. However, many travelers prefer to visit Amsterdam during the spring and summer months when the weather is usually milder and the city is buzzing with festivals and open-air concerts. The highlights are King's Day (27th of April), when the city is one big party area for 24 hours, and the Gay Pride (usually the first weekend in August), when colorful boats with well-built young men parade through Amsterdam's beautiful canals. Amsterdam has plenty of accommodation ranging from luxurious five star hotels such as the famous Hotel Pulitzer, Amstel Intercontinental or Hotel de l'Europe, famous hostels such as the Flying Pig, and even campsites such as the popular Vliegenbos. A nice thing about Amsterdam's hotels is that they are much smaller and more intimate than usual (even when the big ones are just as large as elsewhere). A special tip from this Amsterdam city guide: the best way to get around Amsterdam is by bike. You can rent them for around 10 a day from e.g. MacBike at the Central Station and elsewhere in the city. However, the city has an extensive public transport network that includes trams, subway, busses, night busses and a ferry that provides the connection with the Amsterdam North neighborhood, located across the IJ. The blue and pink paper tickets (strippenkaarten) aren't valid anymore - you now need to use a PT smart card (OV chipkaart). When entering ("checking in") a tram, bus or subway, you have to hold your smart card against the reader until you hear a beep. Don't forget to "check out" in the same way when leaving the tram/bus/subway, or it will cost you much more. If you're staying for a longer period of time, then an anonymous smart card has advantages. If you buy one (for 7,50), it has no credit yet, so you need to charge it with credit at the vending machines which are in all Amsterdam train and subway stations, as well as in some Albert Heijn and Primera shops. Vending machines accept euro coins and Dutch bank cards, but often no credit cards. 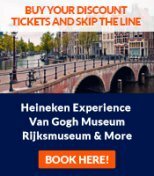 Of course, if you have the I Amsterdam card (which gives free access to trams, buses and the subway for 24, 48 or 72 hours, next to free museum access etc.) then you don't need to buy any smart card to use public transportation. Amsterdam is bursting with cafés. Typical for Amsterdam are the brown cafes (what the British would call a pub), grand cafes which are large and classical, and designer cafes which are hip and trendy. Some of the best are on our Amsterdam cafes page. Outside Surinam, the Surinamese restaurants can almost only be found in Holland since Surinam (in South America) is a former Dutch colony. Their cuisine is an original mix of Javanese, Hindu and Creole influences. But with 175 nationalities as residents, Amsterdam is very international and you can find food from all over the world here. If looking for a place to kick off your evening, beer cafes and "proeverijen" (tasting houses) may be a good choice. Some of the best are in our Amsterdam pub guide. This Amsterdam city guide continues with best places to shop. Kalverstraat, Amsterdam's most famous shopping street that stretches from Dam Square to Muntplein is packed full with clothes shops of many high street brands, cosmetics shops but one can also find a few book shops and fast food restaurants. For a more original shopping experience, go to Haarlemmerstraat & Haarlemmerdijk and browse the quirky designer boutiques. If looking for antiques and unique gift ideas, the Nine Streets area (between Leidsestraat and Raadhuisstraat) offers plenty of options, not to mention the fine but small eateries and bars scattered along the canals. 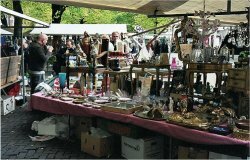 Amsterdam's flea markets are also well worth the visit: Noordermarkt in the Jordaan area is open on Monday and Saturday mornings, but the one at Waterlooplein can be visited daily until late in the afternoon. Tulip bulbs and traditional souvenirs are to be found at Bloemenmarkt, Amsterdam's floating flower market located on the Singel canal. While the flower market features in each Amsterdam city guide, regular Amsterdammers also shop here. Next, Amsterdam's clubs are primarily concentrated around Leidseplein and Rembrandtplein areas. Paradiso (Weteringschans 6-8) and Melkweg (Lijnbaansgracht 234a) are a good choice not only at weekends but also during weekdays and are hugely popular with students. They often have often live bands, both established international names and upcoming bands. The Escape (the Netherland's best known night club) and Studio 80, two major night clubs located next to each other at Rembrandtplein attract a very diverse crowd. The Jimmy Woo (Korte Leidsedwarsstraat 18) and Bitterzoet (Spuistraat 2) night clubs are seen as very hip. Go here you want to know more about Amsterdam clubs. 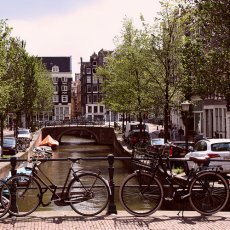 Anything to add to this Amsterdam city guide? Please contact us.